This recipe is a game changer. In the past year there has been a lot of buzz and news about the Cronut. Most of it exciting, and all of it thanks to the pastry genius of Dominique Ansel. But today we have new Cronut-related information to share with you, and it comes from the daring and crafty hands of food blogger Amy, the brains behind Oh, Bite It! 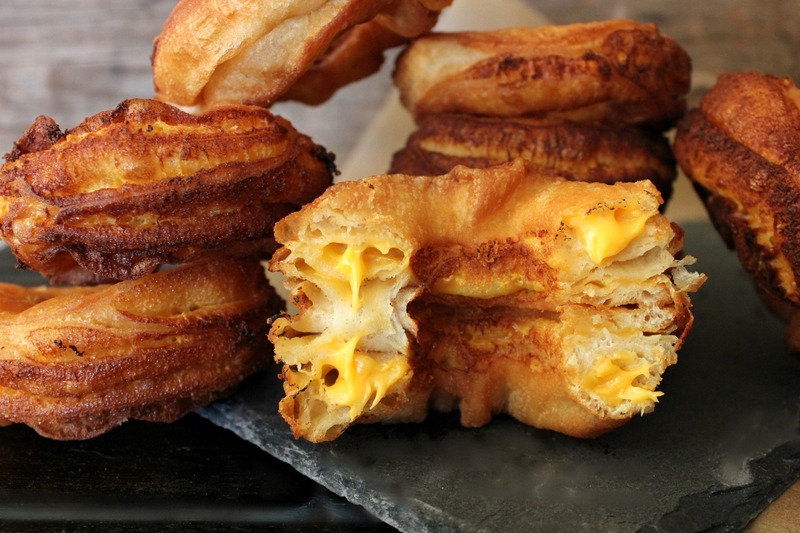 Amy has taken America's two most glorious foods -- the grilled cheese and the Cronut -- and merged them into ONE. The good (and bad) news is that they're super easy to make. Anyone familiar with Oh, Bite It! knows that this cooking genius is not one to labor over difficult recipes. The ingredient list is lowbrow -- it calls for Pillsbury Crescent Dough Sheets, Velveeta cheese slices and oil for frying. The whole thing comes together in a few short minutes -- unlike Ansel's Cronut recipe which takes three days. And the result is something you will never forget -- especially if you serve them with tomato soup, which of course you should. Get the Arugula And Ham Grilled Cheese recipe from sixteenbeans. Just classic. Gooey cheddar, salty ham, peppery arugula. We'll take three. Get the Spinach And Artichoke Grilled Cheese recipe from Annie's Eats You could stuff spinach, artichokes and cheese into an old shoe and we'd probably love it -- but we're sure this will be significantly tastier. Get the Bacon, Egg and Hashbrown Grilled Cheese recipe from Brown Eyed Baker This is the only breakfast sandwich worth eating. It is a one-stop-shop of deliciousness. Get the Bacon Jam and Avocado Grilled Cheese recipe from Closet Cooking Every time we look at this photo, we have to stop to catch our breath. Get the Fried Chicken And Waffle Grilled Cheese recipe from Adrienne's House We used to think that chicken and waffles were one of the greatest combinations of all time -- and then we saw this and realized how small-minded we'd been all along, as the original lacks cheese. Get the Grilled Pimento Cheese Sandwich recipe from Honeysuckle Life This staple of Southern cooking is a classic for a reason -- it is one of the most delicious creations on earth. Get the Grilled Cheese With Avocado And Heirloom Tomato recipe from Fifteen Spatulas You will get us EVERY TIME with a picture of gooey cheese, guys. Get the Garlic Focaccia Grilled Cheese recipe from Keep Your Diet Real We are launching a full investigation as to why grilled cheese is not made on garlic bread more frequently. Get the Tomato Basil Grilled Cheese from Espresso and Cream This grilled cheese looks like the simple, comforting sandwiches of our youth -- but with a fresh, herbaceous twist. Get the Lamb Grilled Cheese recipe from Pass the Sushi We love gyros. We love grilled cheese. Put them together? Minds get blown. Get the French Onion Grilled Cheese recipe from Portuguese Girl Cooks I think we can agree that the only way to improve upon French onion soup is to put it between two slices of buttered, toasted bread. Genius. Get the Watermelon Grilled Cheese Bites recipe from Brit + Co. We love this modern, bite-sized take on a grilled cheese. Grilling watermelon and halloumi, then sandwiching them together sounds like summer in a bite. Get the Grilled Cheese Pull-Aparts recipe from The Creamline "Whoa. Whoa. Whoa." That is all we could say when we found this recipe. This is brilliant, simple and makes us wish we could reach into the computer and pull off a piece. Get the Homemade American Cheese recipe from Inside Nana Bread's Head Sometimes you just want a classic, comforting grilled cheese without having to use processed American cheese. Make your own! Get the Super Frico Grilled Cheese recipe fro Steamy Kitchen A grilled cheese between two crispy cheese-skirts. This has got to be the ultimate grilled cheese.